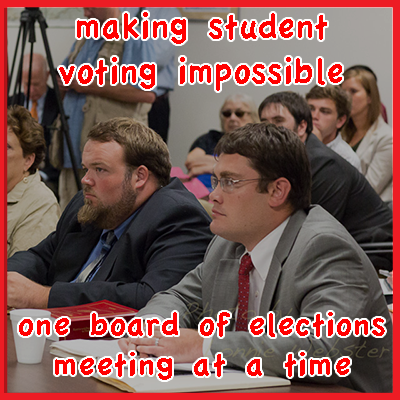 WataugaWatch: NC State Board of Elections: Fine By Us If You Want to Suppress the Votes of College Students! NC State Board of Elections: Fine By Us If You Want to Suppress the Votes of College Students! The Republican-dominated State Board of Elections (SBOE) totally gets it: Their job is to enable and rubber-stamp whatever the Republican-dominated local boards of elections in all 100 counties do to block ballot-access, because they all understand that their electeds don't continue to stay in office without voter suppression. One of the groups targeted for suppression: college students, of which Watauga County has a bunch. The campus of Appalachian State University has had an Early Voting station in the Student Union since 2008 for every election cycle -- up until last fall. Thousands of voters, including voters registered in every precinct in the county have voted there. Faculty and staff, who live all over the county, have found it very convenient to vote where they work. But not any more. Yesterday, at the Embassy Suites in Cary, the majority members of the State Board of Elections brushed aside all the arguments against Republican Bill Aceto's plan to put one Early Voting station at the county admin bldg in downtown Boone, to serve over 60% of the voters, and to place several other sites remote from Boone. The SBOE interrupted Kathleen Campbell's presentation repeatedly and would not let her finish. All they wanted her to talk about were the hours of operation for Early Voting. It was as clear as a Carolina blue sky that the fix was already in before the meeting started: the SBOE intended to change Aceto's plan only so far as the hours of operation. And they even messed that up. Aceto wanted all sites -- both in Boone and the remote sites -- to open from 8 a.m. to 4 p.m. every day for the entire Early Voting period. What was decided yesterday extended evening hours -- good! 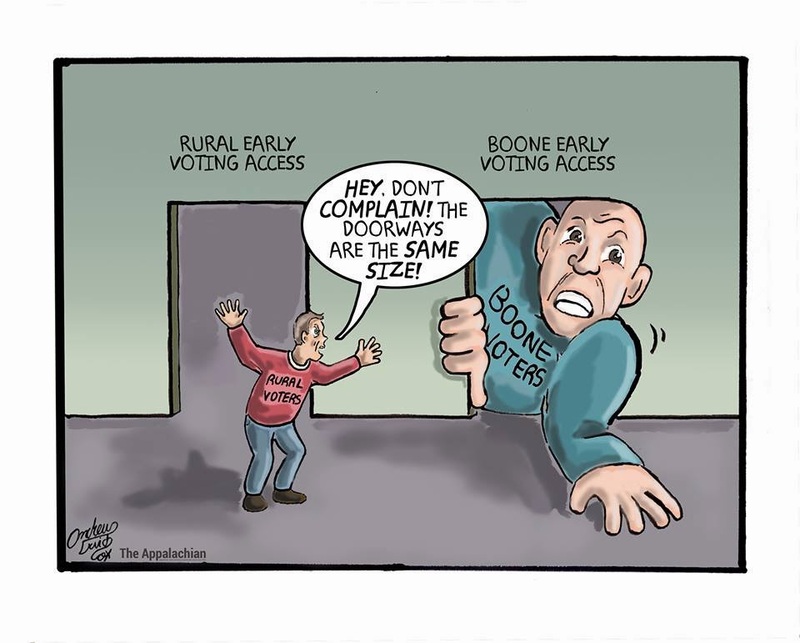 -- but mucked up the starting hours: For the first two weekdays of early voting, one-stop sites will now be open from 8 to 4 in the county and 8 to 5 in downtown Boone. The following week, all sites will be open from 11 am to 7 pm Monday through Friday, and 8 am to 1pm on the final Saturday. That means, if you're loitering around the Courthouse during early morning in the second week of Early Voting, you'll have to wait until 11 a.m. to cast that ballot. Early birds need not show up! 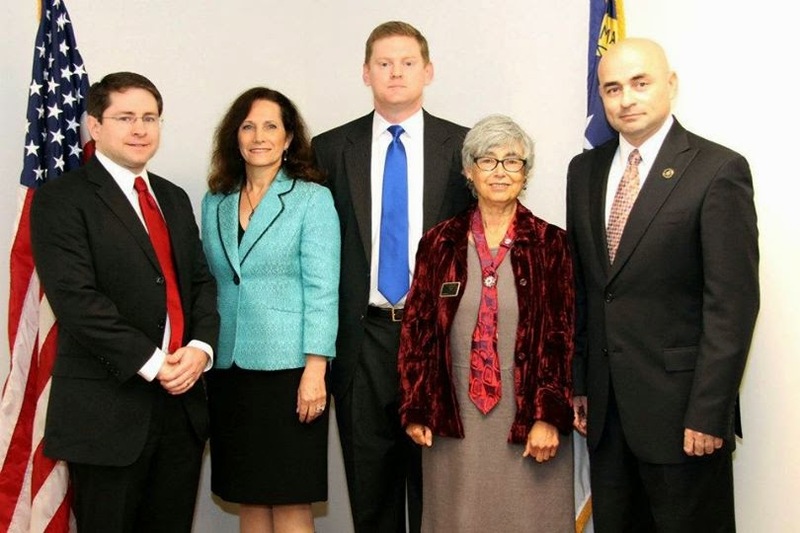 Chair of the Watauga County Board of Elections has become a disappeared person. He didn't bother to show up in Cary yesterday, and he's become a virtually invisible public official. He's ceded everything to BOE Secretary Bill Aceto. Aceto said yesterday that he wouldn't consider a polling site in the ASU Student Union because it was impossible to control electioneering. He mentioned the "intimidation" of voters. He actually said that. Handing out voter guides and candidate material is now officially "intimidation." Wonder if he intended to include former Republican candidate Tommy Adams in that smear? Adams was running in 2012 for County Commission and was in the hallways of the Student Union every day and virtually every hour of Early Voting, and he was not shy about button-holing students. Other Republican candidates were also working those halls. If the students weren't buying what Adams et al. were peddling, I think we've found the real reason Aceto won't consider Early Voting in the Student Union. College voters actually can recognize creepiness when they encounter it, and they don't like the Republican vision of "All for Me, None for You!" For the record, Bill Aceto himself voted at the Early Voting site in the Student Union well before he began "fighting on the front lines" of voter suppression, as Watauga Republican Party Chair Anne Marie Yates memorably praised him at the Republican County Convention on Saturday. "Start a War or Build a Community"
The lone Democrat on the SBOE, Maya Kricker, was the member who asked Aceto why he wouldn't consider Early Voting in the Student Union, after having it there for so many election cycles and after Boone residents and ASU employees had grown accustomed to having it there. "I don't see a compelling public interest in eliminating an early voting site that has served so many voters. The perception of fairness cannot be overstated .... We can create a war zone or we can build a community." Zing! A war zone is exactly what Bill Aceto and Four Luke Eggers began to create in August 2013, when they rammed through a series of new resolutions written by the Republican County Attorney Four Eggers to block ballot-access for college students and incidentally try to force Elections Director Jane Anne Hodges out of her job. Citizens rose up against this agenda. With this new regime in control, Republicans thought they'd have a cake-walk taking over Boone Town Council last fall. Didn't work because voters got super-angry at the obvious, corrupt manipulation. Bill Aceto is still ironically bragging that he and Four Luke have increased voter turnout since they took over the local BOE. He said that same line again yesterday in Cary. People from Boone laughed. "The Lone Democrat on the SBOE"
Maya Kricker was the only member of the SBOE to show any interest in the constitutional problems of fencing off a class of voters and imposing undue ballot-access burdens on them. There is another nominal Democrat on the SBOE -- Joshua Malcolm -- but he's settled comfortably into his role as Klingon warrior for the dark empire. At one point yesterday, Malcolm held up a 3-inch-high stack of communications from Watauga County voters asking for an Early Voting site in the Student Union. Malcolm actually asked Kathleen Campbell, "These are from citizens and not students?" "Citizens, not students." Last any of us checked, college students are also citizens of the Republic, Mr. Malcolm. That brand of thinking will get memorialized in a federal lawsuit near you one day, as it certainly got you appointed to the SBOE by the Dark Empire. One very interesting side note about "maps with circles": The previous bedazzlement expressed by SBOE members for county maps with big, equal-sized circles on them totally evaporated yesterday (because none of those circles established any data on population density). Malcolm could not let it go, however, without defensively claiming that it was never just circles on maps that had motivated his preference for majority Republican Early Voting plans all across the state. No, perhaps it was oxygen deprivation, living in the Republican pocket. My first time reading your post. Saw it in a tweet. Great stuff to keep me in touch with Watauga County! Sorry to hear things are such a mess there, too. CLEARLY college students are not "citizens" - they're engaged in the great challenge known as higher ed, something NCGOP wants to dismantle. I suppose they're trying to create "community" rather than a "war zone"....but in this instance it makes no sense to me either. You don't roll over and play dead just to get along. Democratic member Malcolm was ALWAYS going to vote with the Republican majority. Democratic member Kricker acknowledged that she was the lone vote on the SBOE for placing a polling place at the ASU Student Union. Because the ridiculous hours proposed by Aceto were changed to accommodate more working people, Kricker (reluctantly) went along with the amended plan.